In addition to creating some of the best makeup of all time, cosmetic guru Bobbi Brown is secretly an avid yogi, clean eater, and health nut (who knew?!). As the first subject of our brand-new series (where we profile well-known power women who are secret health and fitness aficionados), Bobbi Brown shares some of her healthy lifestyle habits with us. Glamour: What's your favorite form of exercise? Bobbi Brown: "I love to start my days with some yoga or I'll go spinning or running. Exercising in the morning leaves me feeling energized and accomplished, even if it's just for 30 minutes." "I'm a huge fan of eating healthy. Your diet directly impacts your overall health as well as how you look so it's important to maintain a healthy, well-balanced diet. I try my best to eat a good deal of foods rich in omega-3's like salmon, almonds, walnuts, and olive oil. These foods have skin-repairing benefits, while fruits and vegetables with high water content like watermelon, cucumber, and dark leafy greens will add moisture to your skin. I'm always looking for new, delicious, healthy—and filling—foods, so I now incorporate chia seeds into my diet as well. They are high in protein and fiber, so I put them in smoothies and oatmeal and sprinkle them onto salads." What other healthy habits do you have? "At home in Montclair, New Jersey, I regularly see David Thatcher for Rolfing, a holistic form of massage therapy that leaves me feeling instantly rejuvenated. When I'm in Telluride, Colorado, I always pay a visit to Dr. Josh Geetter for acupuncture, and when traveling to Chicago to visit my family, I see Dr. Richard Arrandt at Arrandt Healthcare. He's an amazing chiropractor that I've been going to for years, who I'm lucky enough to call my brother in-law." Any particular healthy products you swear by? "I couldn't live without my Vitamix—it's a game-changer. If I'm not making a hearty soup with it for my family, I'm making healthy protein shakes or smoothies; they're a great way to get your dose of daily vitamins. One of my favorite smoothie recipes is my Coconut Kale Shake. The full recipe can be found on my blog, Everything Bobbi." "I love eating really clean, so a piece of grilled fish with lemon, steamed veggies, and a baked sweet potato is my go-to meal. I always order everything with no salt, no oil, and no butter, or I get those items on the side to control the portions. It's important to me to eat foods that are fresh and organic; I feel my best when I eat this way." What's your favorite unhealthy meal? "I believe if you generally eat healthy foods, there is no need to deny yourself the occasional treats. My favorite indulgences are a few crisp french fries and a great martini. When I travel, I try not to worry as much about what kinds of foods I'm eating. Believe me, if I'm in France, I'm going to have a croissant for breakfast, and if I'm in Italy, I'm going to eat pasta. For me, those indulgences are worth the extra time I'll spend exercising it off." Tell Us About Your New Pretty Powerful campaign. "I always tell women to be who you are—this means everything from learning to love your lines to appreciating your unique features. For me, being beautiful isn't just about how you look. The most compelling beauty is self-confidence. For that reason, I started the Pretty Powerful Campaign for Women and Girls, which empowers women and girls through educational or career training programs. When a woman is educated there are no limits to what she can do." "This year, on International Women's Day, March 8, we'll introduce the Pretty Powerful Pot Rouge in a limited-edition shade, Pretty Powerful II, a universally flattering pink that leaves a sheer, soft stain on lips and cheeks. The entire retail price—$27—is donated to the Girl Rising Fund, which helps girls in developing nations gain access to education. 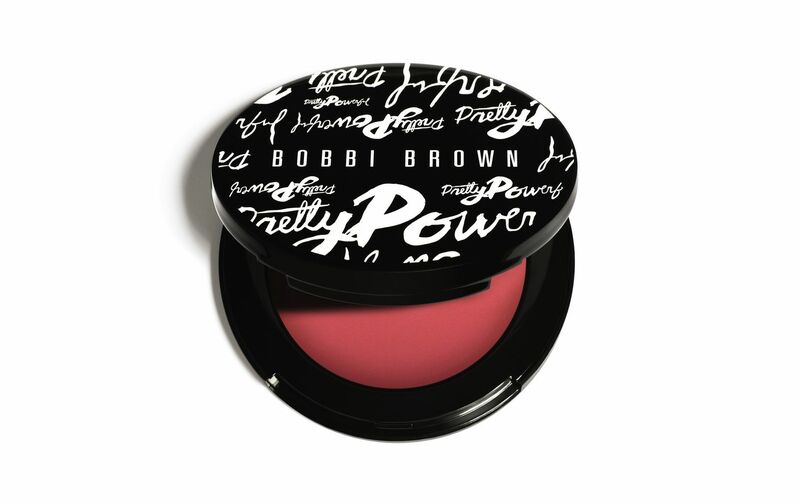 In addition to this product, I also allow women to make a donation to the Pretty Powerful campaign at checkout while purchasing anything on bobbibrowncosmetics.com."